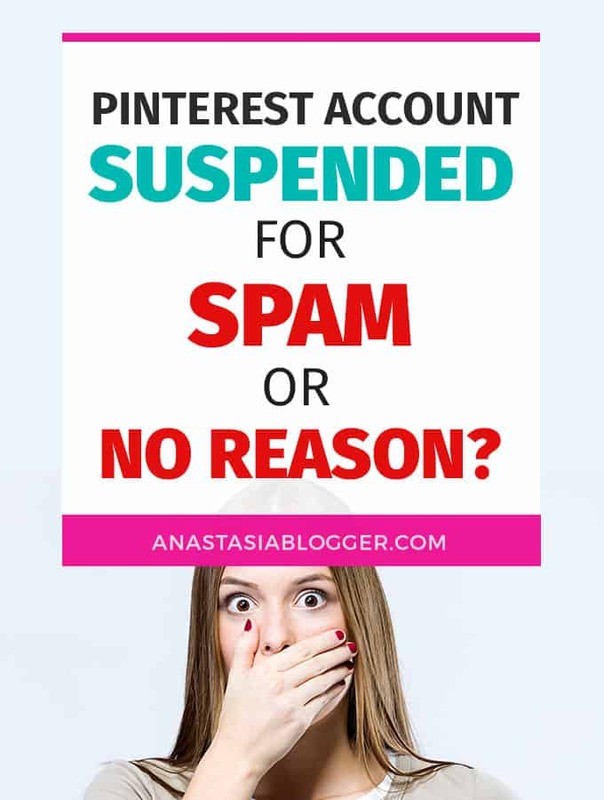 Is your Pinterest account suspended for spam or for no reason at all? Unfortunately, this happens. Here is what you should do to reactivate your account and to prevent future problems on Pinterest. Can you get banned from Pinterest? If you are using Pinterest as a content creator getting banned from Pinterest is a big deal for you, more than for any regular user. Meaning, you have a website, blog or Instagram, Youtube account associated with your Pinterest account and you want to promote your content and drive traffic from Pinterest. If a regular user gets into trouble on Pinterest, the worst case scenario for him is that his boards and images saved on them will be lost. But a regular user can always create a new account and keep saving ideas on Pinterest. However, for a content creator getting banned from Pinterest means that their domain or account is marked (flagged) and unless Pinterest removes it, there is no way the same website will ever create a new account and start driving traffic from Pinterest again. How do I reactivate my Pinterest account? First, no need to panic if you are a genuine content creator and not a spammer. Just remember that all platforms, especially those in the active growth and development stage (as Pinterest) can have system glitches and mistakes can happen. Step. Take 10 minutes for a short meditation, or breath deep, or count to 100. I’m not joking, it is the very first thing you HAVE to do before anything else in your situation. I know how it feels when all your hard work on Pinterest is canceled in a moment and you feel it’s so unfair when hundreds of real spammers are out there on Pinterest stealing your pins and scraping your content automatically, yet you are the one suspended. I know this. I’ve been in your shoes. But I also know for sure that your email requests and appeals will be at some point read by humans who have emotions too. The person reading your email is just a support representative who has nothing to do with Pinterest algorithm, has no control over spam filters, but has the power of decision to reinstate your account or keep it shut. Now tell me if it’s wise to throw all your anger and frustration to THAT person or it’s better to write an email that is professional, polite and that shows your appreciation of Pinterest as a platform that brings you free traffic. If you advertise on Pinterest, mention that too, not as a reproach but to show how much trust you put into Pinterest. Make it clear that you are a legit content creator, mention you are using only authorized schedulers (or only manually pinning). If you suspect you might have done something by accident that triggered spam filters, apologize for that and say you’ll be very careful going forward. I will mention later in this article what are the possible reasons for suspensions. Ok, now you are ready for step two. Step. Go to the Pinterest Help Center Contact page and select the issue (Appeal =>> Account Suspension). Note: if you received an email notification from Pinterest about the penalty, most probably you will find in it that your account was suspended. If your site was blocked, you should also know because that’s what all your pins will be showing if you try to open them. Step. Send an email asking for help at creators-support@pinterest.com. Creators Support is a separate team inside Pinterest that was created in 2018 to help legit bloggers and content creators resolve their issues with Pinterest faster. Step. Wait 1-2 business days (Pinterest doesn’t reply on weekends) to get some feedback. Step. If you received an email reply that is not signed by a person’s name, and if you received it within a couple of days, that’s probably the canned response signed by “Pinterest team”. You should try to reply to this one again or wait for the feedback from Creators email if you sent it earlier. The problem with these canned responses is they are worded in a really scary way. They might say the decision is final and your account will not be reinstated, however, in many cases, people got their accounts back after “final decisions” pretty soon. In rare cases, Pinterest might block a website instead of suspending an account. These are two different types of penalties. The majority of cases I’ve seen reported by bloggers were called account suspension: the account profile link would not be searchable on Pinterest, the account owner would not have access to his profile, but all links from pins saved on Pinterest by other users would be still active and driving traffic to the website. My own website was once affected by the second and very rare situation when Pinterest blocks the website. It was a quite known glitch in the middle of summer 2018 when hundreds of legit bloggers noticed their sites were blocked on Pinterest overnight (no email notifications were sent when that happened). Pinterest confirmed it was a glitch and reinstated all the accounts within 24-48 hours. What happens in this case – all the limitations described above for the account suspension, but on top of that, all existing pins linked to that domain are returning an error notifying users that the website is blocked for spam. This happens to all pins including those saved by the account owner and all repins linked to the same website. The result of getting your domain blocked is drastic: all traffic from Pinterest stops immediately and goes to literally 0. Pinterest accounts get suspended because they either get flagged by other users or receive too many DMCA complaints because they trigger some spam filters and sometimes it happens as a result of the system glitch. We don’t know all the back-end details about Pinterest’s spam filters, but some information has been shared over time by users who have experienced one penalty or another. I will make a summary below of all types of mistakes that can lead your account to suspension (also called Pinterest Jail). Read the Community guidelines page – everything that you’ll find on this page is very important and violations of these rules can get your account suspended. I would recommend you read the Spam and Quality section especially carefully. Use a business account and verify your domain if you use it to promote a website. Personal accounts used for commercial purposes are frequently shut down. You can also convert from personal account to business without losing your followers. Read here everything about creating business accounts and enabling rich pins. Don’t use Pinterest messages to spam other users. This is a very bad idea, especially if you send links inside those messages. Even if users don’t flag you, Pinterest seems to have spam filters that get triggered by this behavior. At least, in one of the cases when a blogger claimed her account was suspended for no reason, eventually someone from Pinterest replied her account was penalized for sending messages with requests to get into group boards. She probably added links to her site with those requests. If you want to apply to group boards, try to find those that give you an email address for requests. Don’t comment too much the same text under pins, especially with links to your website. This is pure evil spam. Don’t use images of unknown origin and don’t use images you didn’t purchase. This one is serious. I believe that after 3 DMCA complains your site can be suspended. Yes, mistakes happen and I’ve seen reports of bloggers who claim they never used images from other sites, but someone reported them several times in a short period of time and they suspect those might have been competitors. Remember, if something like this happens to you, you can use your right to appeal and explain what you think is happening. Yes, spam filters can be triggered and your account can be suspended automatically. But if you appeal, at some point a real person will look at your account. And don’t expect that people working for Pinterest are not smart enough to see the difference between an account that got into trouble a couple of times by accident, and accounts that systematically use images and pins from other sites. To minimize problems with DMCA complaints, don’t use images you found in Google. Use free or paid stock image sites and always have a proof inside your stock site account that you downloaded the image from there and what type of license you used. Don’t use any unauthorized software that automates your pinning or other activity on Pinterest that is not in the list of Authorized Marketing Partners. The most Pinterest-centered tool widely used for scheduling on Pinterest is Tailwind (you can get the first month for free using my aff link). Don’t pin the same pin multiple times in a short period (especially to the same board). If you are pinning with schedulers, make sure you understand how to use them because automation tools can save the same pins many times if you have a few settings done wrong. If you are just starting with Tailwind, it might be worth taking my Tailwind course to get all the settings right from the beginning and actually save time using this tool. If you are reading this post, it’s possible your own account has been suspended on Pinterest or maybe you’ve heard it from your blogging friends. How did your story end up? Did you get your account back? I told you earlier in the article that even though I follow Pinterest’s guidelines, my site was blocked from Pinterest during a weird glitchy wave together with hundreds of other bloggers. I’ve got my account back within 24 hours, but the traffic loss was a disaster because I lost it all for those 24 hours and it took my account about 3 months to recover after what happened and get back to normal traffic level. If your account was ever suspended, what was the reason? How long did it take to get it reactivated? Let’s share our experiences so that people who are in trouble right now don’t feel alone and so desperate. If you found this article helpful and you think your blogging friends might also find useful info here, don’t hesitate to use the social sharing buttons below. We never know when Pinterest suspension might happen to any of us, so I recommend you to save THIS PIN below to your Pinterest Marketing board and in case this happens to you – I’ve got you covered. Let’s hope that it will never happen, but better to be prepared with all the steps, links and email addresses to contact.